Wow it is amazing how fast time goes by. I haven’t blogged in two weeks! Well I’ve been sick with a cold which is no fun when you are expecting. Can’t take much medicine and it takes a lot longer to get over it. Boo. I honestly can’t tell you what else I’ve been doing… Being lazy about blogging I guess! 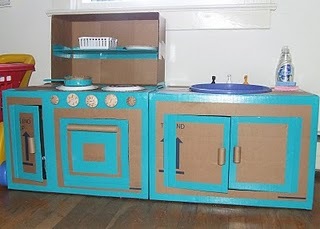 Anywho it’s already late but I wanted to share some fun photos of a homemade cardboard kitchen that my awesome friend Em made for her daughter Sierra. When I saw her post I was amazed! 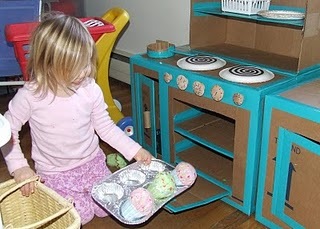 Who knew you could make a whole kitchen for your child to enjoy? What fun! With Em’s permission, here are her pictures of the kitchen she created. 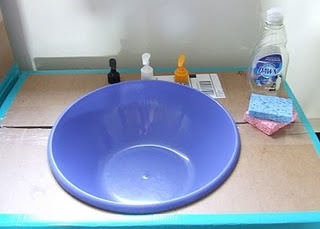 Read her blog to learn more about how she did it. 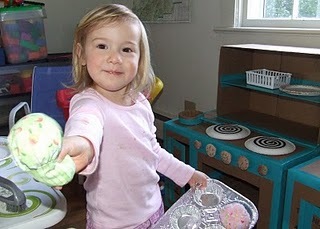 Her cupcakes are made out of felt cotton! Thanks Em for letting me share your homemade project. Again check out Em’s blog to learn more about making this kitchen. This weekend I will be traveling to Seattle for a wedding/girls weekend. I’m very excited. I’m going to get to spend a whole weekend with my college friends Em, Jen, Leah and Suzanne. I’ve never been to Seattle before so I’m looking forward to exploring a new city. I’m so excited to see you tomorrow! !